I’m a CORE eFellow. Even though I’ve been to my first hui, I still can’t quite believe that once again I’ve blagged my way into something far exceeding my skills and abilities. I look around at the amazing, passionate, innovative educators around the hui table and think, ‘Really? They picked me?’ But they did, and I’m grateful. I’m also grateful for the overwhelming sense of relief that I experienced sitting in Auckland airport on my way home. Exhausted yes, exhilarated yes, buzzing with ideas yes, but mostly relief. I had expected to feel scarily confronted with educational ideas that I didn’t know how to wrestle with. And while there were certainly interesting philosophical discussions, there wasn’t anything so new or so ‘out there’ that I didn’t know where to begin to engage. Whew. The dedicated list-maker in me (yes, I outed myself as being ‘Monica’ from the American sitcom Friends – I can have fun, I just need it to be tightly controlled. And tidy.) also feels much more comfortable with understanding the overall shape and expectation for the eFellow year of awesome learning. I’m seeing this experience as kind of like a ‘mini-Masters’. Employing educational research methodologies to investigate an area that for me has a clear sense of moral purpose, to keep my project small and simple in order to present at ULearn15 and deliver an EdTalk for CORE Education. 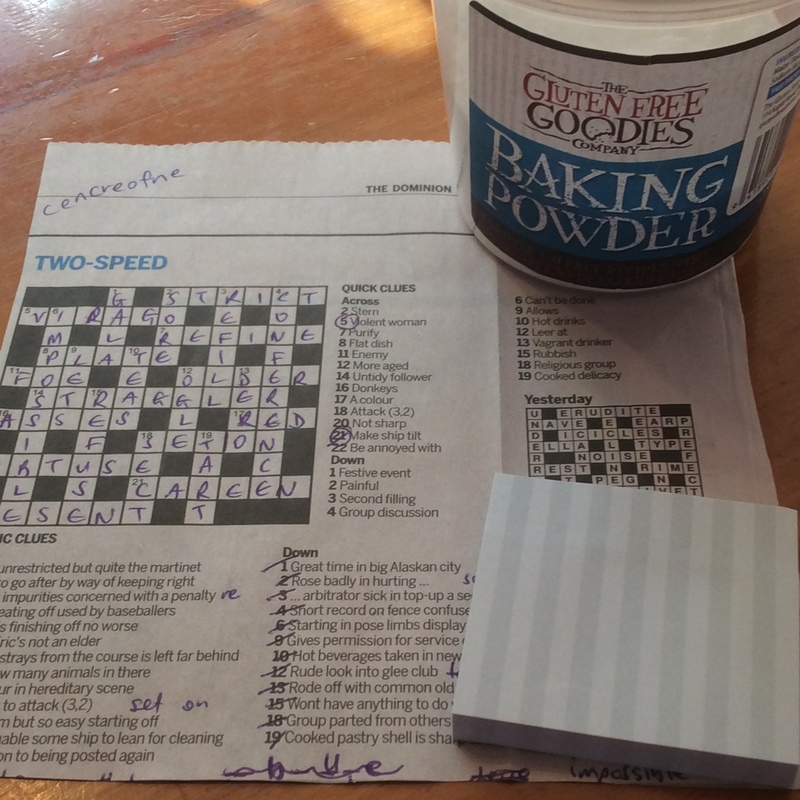 Very briefly, I brought along a Dominion Post two-speed crossword (because I love the power and slipperiness of words), Baking Powder (because I’m a bit clueless at the moment about my new job that I haven’t started yet, but I’ve taken it because I want to be an agent of change), and post-it notes (because I love design thinking and the way it is creative and yet structured). Exploring these, and later on in the second day, exploring more in-depth as to what we each believe the purpose of education to be, truly reveals so much about a person. It was amazing that without sitting around and hearing one another’s life stories, we quickly got an insight into each other. And this is something I want to take into my research. Once this is a little more concrete, I’ll blog about that, but suffice to say that something I learned from Louise and John is the power of stories, but, more importantly, the power of having your story heard. And I want to hear the stories of teachers. I want to be a respectful listener, not a preachy mouth. If people feel heard, and therefore respected, appreciated and safe, perhaps they’ll feel confident to embrace something new. And my first eFellow hui certainly made me feel this. Teachers from my previous school may have a wry smile to themselves as to the topic of this blogpost. The school principal frequently starts the year by asking what our ‘word for the year’ is. Personally, I like this approach. I like words, and the power of one word to shape a year is not to be underestimated. Last year, my word was ‘innovate’. This helped me to remember that I was aiming for more. Better relationships with my students. More meaningful, insightful, authentic learning to occur in my lessons. Ways to integrate technology into my classes that went beyond a $1000 pencil or electronic exercise book. I find that my word for the year seems to just pop into my head. I don’t go looking for it, it just appears. And if it stays, then I know it’s the word for me, even if it’s word I’d prefer not to have. This ‘sticking power’ is what I find so useful about having a word for the year. Don’t get me wrong, I believe in goals, and in setting down plans and ideas that you wish to accomplish. But I don’t find these as easy to remember, as easy to keep at the forefront of my mind. One word though, now that’s easy. So, this year’s word? Learn. I like choosing verbs. They’re a call to action. They help me frame what it is I’m doing. I’d probably prefer a more elegant word for 2015. Inspire. Yeah, that’s what I’d rather be doing. But ‘learn’ has stuck. And I’ve already come to appreciate that I need to learn before I can be inspired, or perhaps be lucky enough to inspire others. And I’ve got a lot of learning ahead of me: a CORE Education eFellowship for one thing. And a brand new job with The Mind Lab for another! A month or so ago I was looking to capture my ‘moonshot‘ for education, using the language of design thinking to frame what I feel my purpose is. It’s still a work in progress, and I’m sure it’ll show up on this blog at some stage. But I’m still wrestling with it. It doesn’t sing to me yet, and it doesn’t have the same stickiness as my word does. And I think that’s primarily because I need to learn more first. As Ewan McIntosh might tell me (I’m reading his book How to Come up with Great Ideas at the moment), I need to immerse myself more yet. To me, this immersion is synonymous with learning. My moonshot can’t be forced. I have a few more questions I need to explore yet. And so, for 2015, I’ll learn. To shape my reflection of this unit of work, I’m going to use some of the headings from the d. School design thinking process that we used as our base structure. Under this heading, I’m going to focus on what my students thought of the unit we completed, and what they reported they learned through their reflections. I was equally pleased, however, with their obvious enjoyment of the prototyping phase. Being a highly academically successful school, sometimes I worry that our students are afraid of taking risks and being ‘wrong’. Learning to fail fast, fail forward, and fail with a positive attitude to build resilience is crucial. So to hear comments like: “it takes a while to get the exact thing that you want/like,” and: “I learnt how good it is to design something without it being perfect and then changing and evaluating later,” made me feel proud. Design Thinkers must be selfless people. In this section, I’m going to outline the unit that I put in front of the students. 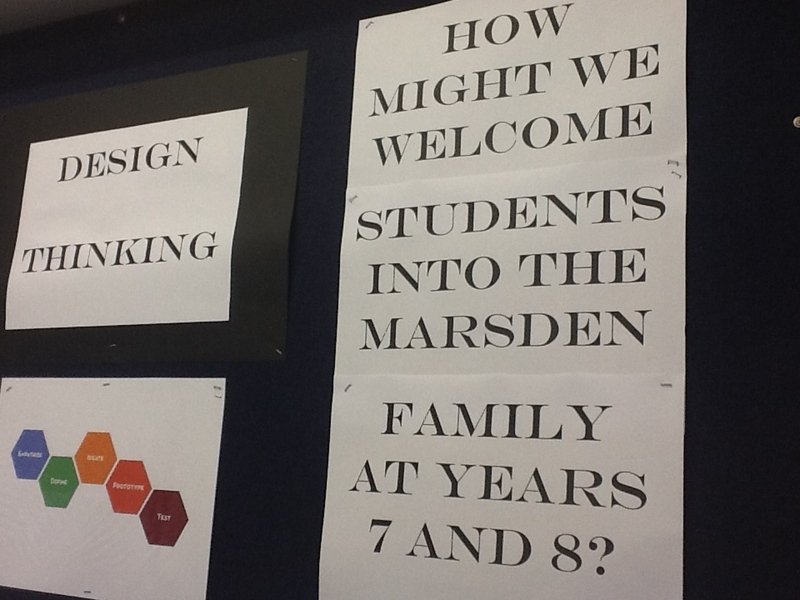 I had no preconceived ideas of the products or solutions I thought the students might come up with. 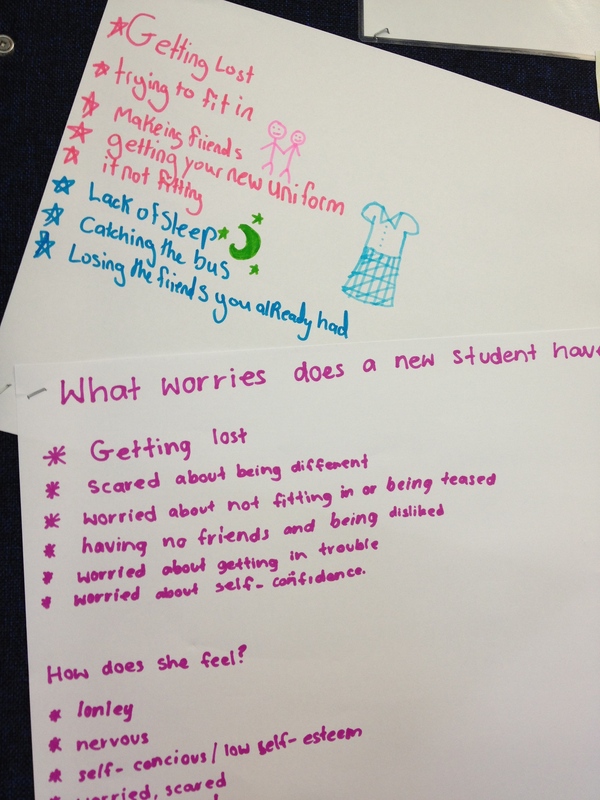 I really just wanted an authentic issue – the overarching question links to something staff had been discussing over the year – and a context the girls themselves could easily relate to, with resources easily on hand. I’m indebted to the #dtk12chat community, and this LiveBinder resource, curated by Thomas Riddle. And from this resource, I based my unit on this challenge. The folder of resources I created is available here. Something I was pleasantly surprised to learn about a benefit of using a design thinking approach was the way that it made me be much more consistently explicit about what we were doing, and how it tied into the bigger picture of the unit and the guiding ‘How Might We’ question. I became much more focused on the learning. 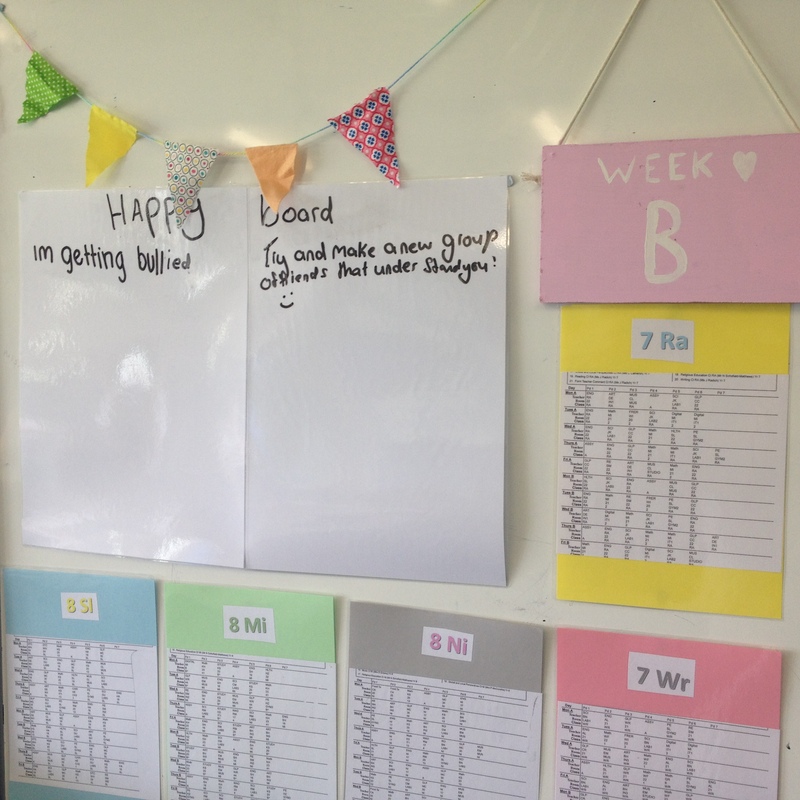 Instinctively, I started to write reflective sentence starters on the board for students to use in the middle and/or at the end of the lesson. This is something I would like to formalise more in a future iteration. Schools who use a learning portfolio could really capitalise on this. Overall, what I needed to improve on was the ‘define’ phase of our unit. This was woolly and waffly, and the girls themselves identified this weakness in their reflections. We had a guiding ‘HMW’ question already, and although we spent time writing point of view statements (‘___ needs a way to ___ because she ___’) these weren’t quality and therefore failed to be of sufficient value. Subsequently we didn’t whittle our mass ideation down well. 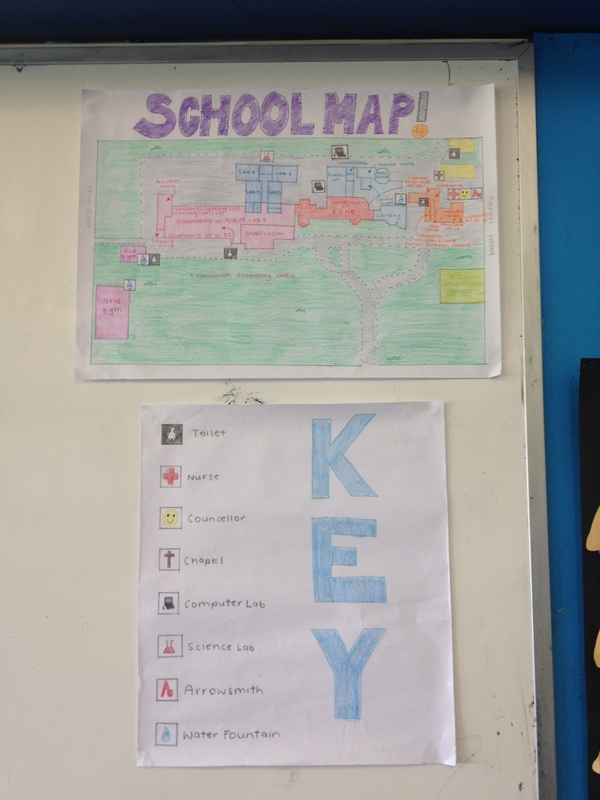 Although the overall products definitely met the brief, and have been taken up by the school for implementation in 2015, we lost our way in the middle here. In this section, I’m going to brainstorm some ways in which I could improve this unit in future, particularly focusing on the identified weak points of the ‘define’ and refining ‘ideation’ phases. Have a formalised reflection log. This could take the form of: portfolio, blog. Consider other forms, e.g. voice/oral reflection. Spend more time explaining the ‘point of view’ statements. Just as we did with ‘ideation’ and ‘prototyping’, build these skills first. Have a practice run. Rather than write ‘point of view’ statements, refine the original ‘how might we’ question. Write a ‘point of view’ statement for an actual person, rather than a fictional girl. Write a different ‘point of view’ sentence frame that suits the specific challenge better. Research other user statements to use in place of the ‘point of view’ statement. Evaluate the defined problem in light of the over-arching HMW question. Use more than one method of refining ideation: 6 stars; safe bet/long shot/darling; rating system e.g. novelty, usefulness, viability, risk. Think about what online tools could help, e.g. writing user/point of view statements in Google Docs for ease of collaboration. Google Forms to rate ideas/get feedback on point of view statements. Sum up what’s been learned by empathising to guide more direct links to defining a specific problem/area of focus. Because I won’t be in a formal classroom like this in 2015, I’m not going to prototype a further iteration of this unit at this stage. Overall, I thoroughly enjoyed teaching this unit, but, more importantly, teaching in this way. It confirmed for me the power and promise and purpose of design thinking, which I’ve written about before here. 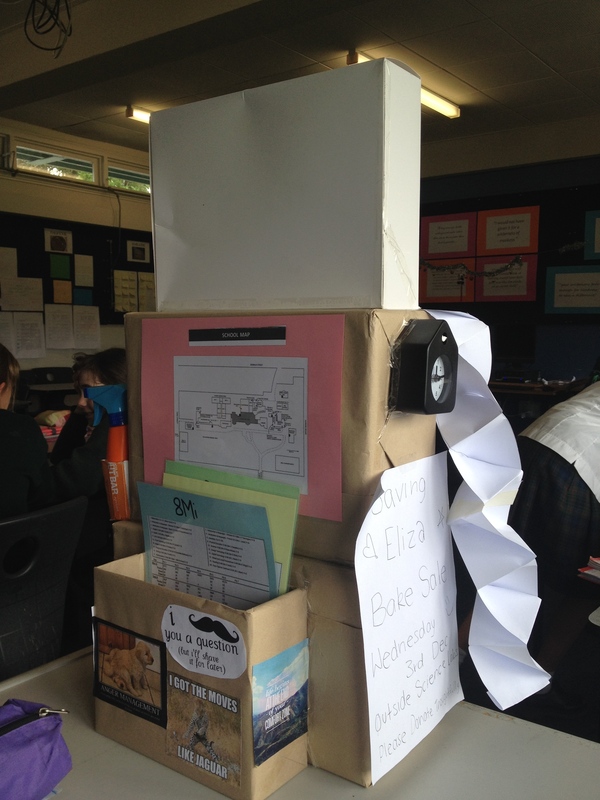 I was highly amused at the stumbling block we hit as a class once we finished our prototyping phase, and I expected the students to actually create their products/solutions. 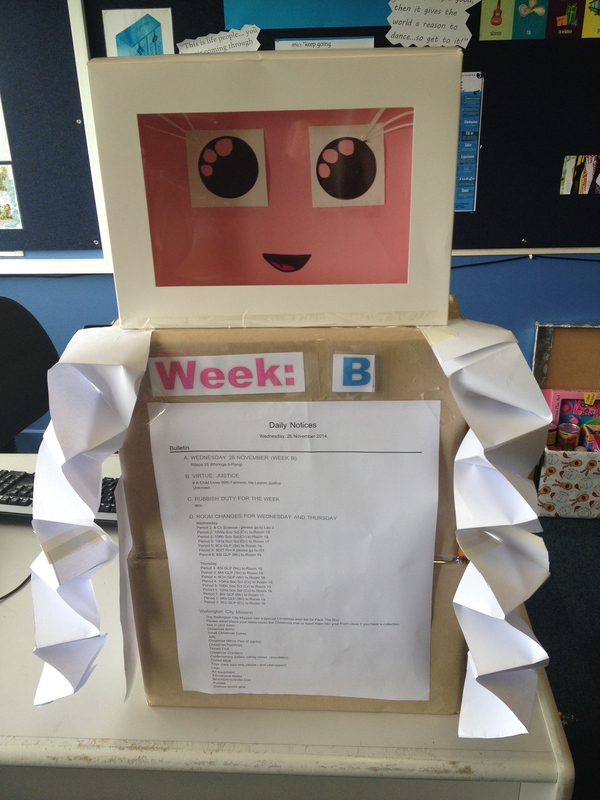 The girls thought I meant just making a ‘tidier copy’ of their cardboard creations. It took almost a full hour to convince them I meant otherwise. This brought home to me that mostly teachers require ‘fake real’ projects from their students. Unschooling my students out of this, albeit briefly, was a win. These are the girls’ final products. They presented them to their deans, who were so impressed they had the girls work on a modified version for use with the new students starting next month. I hope my students learned that they have a voice to create something of value, that they have the skills and resources, and, most importantly, the disposition to make a contribution. It was a lovely summer’s evening in Wellington yesterday. As befitting such an evening, we were eating outside, and dining on a nice, light, post-Christmas meal of fish, corn on the cob, and salad. I trialled a new recipe: marinating the fish in some lemon and fresh herbs from the garden. The salad was a tried-and-true: a tasty Nigella number with feta, watermelon and olives. The combination of the salad and the fish was delicious! I was very happy with the feast. While I was eating and enjoying the fruits of my labour, I was thinking about how I might even further improve on my efforts. Add lemon thyme to the oregano I used in the fish marinade. Make sure I use black olives rather than the lemon flavoured ones currently in the fridge. Definitely don’t marinade the fish any longer than I did – the citrus could easily become overpowering. I wondered what using lime rather than lemon would be like…? And I realised: I was tinkering. I was reflecting with pleasure on what I had created, and was thinking about what I could do to make it even better next time. While there was obviously an element of judgement involved – how to improve – it was not negative as it was building on the enjoyment from my first iteration. This is growth mindset. This is a maker mindset. If I’m happy to do this with my cooking, how might I inject this same attitude towards other areas in my life? Suggestions gratefully received!